Mike was in the 5th grade, just starting to get interested in music, when he had to make his first "career decision": Trumpet? Guitar? Or saxophone? The saxophone won, and so have all of the friends and fans he's made over the past 35+ years playing in more than a dozen bands doing everything from Motown, Disco, and Jazz to Country, Beatles, and 80's/90's pop. 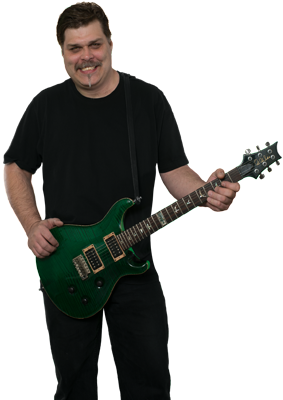 With that kind of versatility, Mike can go from smooth and sultry to sassy and screaming – and everything in between. His first band out of high school was called Those Guys, where, for a year, he played with his drummer brother, Eric. After about four years, Mike joined Special Request, an all-occasion group that traveled a lot and played gigs in Cincinnati, Columbus, Pittsburgh, West Virginia, and, of course, locally. During that time, they played at a lot of private events at the new venues in the Cleveland area: the Rock & Roll Hall of Fame, Great Lakes Science Center, and Jacobs Field. After that, he joined the extremely popular Stagepass, which was primarily a Michael Stanley tribute band, but also did some Southside Johnny and Bruce Springsteen tunes as well as other assorted oldies-but-goodies. The next stop on his musical journey was The Vibe, formed by several members of a group that had been backing a local country singer but had a big repertoire that included Motown, Disco, oldies and pop tunes. After several years, Mike decided to take some time off to spend with his family, filling in only every once in a while. In 2008, he returned to the business and joined the popular Pieces of Eight band, where he's found a "permanent" home. Early in 2013, he took on the additional role of playing with Chad Ely and The Explosion, where he has sweet featured solo in the band's first single, "All I Need is You." Mike, who's nickname is "Winthorpe" (Don't ask! 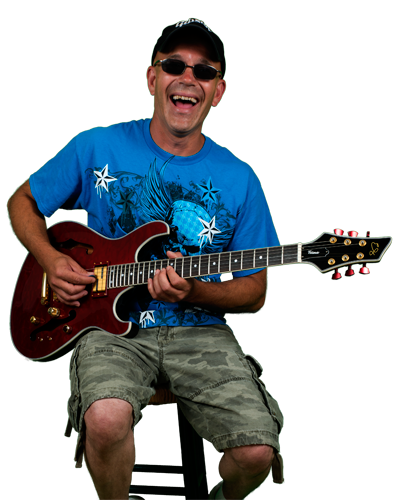 ), has also performed with Abby Normal, Stone Pony, Sister Kate, Special Blend, Madison Jazz Project, Lakeland Civic Jazz Band, Youngstown State Jazz ensemble, and No More 925. He's married, has two daughters, and lives in Chardon. His "day job" is as a painting contractor. It's no surprise Joe picked up music. It started when he could barely talk. His parents, both musicians and music teachers, were the heart of a musical family with Joe and his older sister, Kathy. His mother eventually stopped teaching to take care of the family but continued in her love of music. Joe's father began teaching in 1959 and retired after teaching 30 years in the Madison High School. Most, if not all of Madison, know Joe Sr. ("Mr. A. "), if not as a former student, then certainly by reputation. 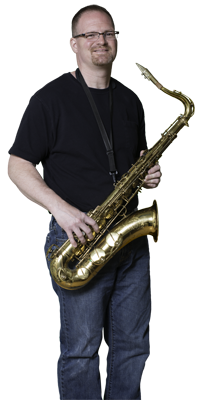 In fact, Chad Ely was taught alto sax by Mr. A. in the ninth grade. 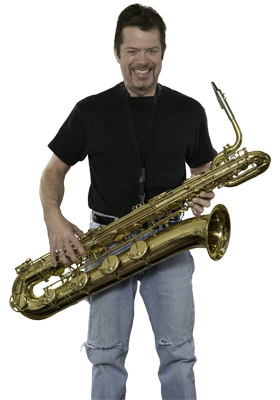 Joe played tenor sax in Jazz Band during high school, but he would also occasionally pick up the school's baritone sax and fell in love. He told his dad, "This is the one I feel!" Joe says now, "It was like I met my girlfriend!" He went into the corporate world and gave up playing for about ten years because of job changes and relocations. But, when he landed in West Palm Beach, he started up again on a borrowed baritone sax with the Community Concert Band, which was directed by his brother-in-law, a well-known band director in Florida. More recently, on his return to Madison, Joe played with local rock bands, often with his dad in the audience and his dad's borrowed sax on stage. "Mr. A." a little concerned about his vintage Selmer sax in bars, told Joe to get his own instrument. He did, and now performs with one selected, tested, and approved by Ian Early of The Cherry Poppin Daddys. Joe is amazed how life comes full circle: With The Explosion, he's playing with his dad's former students, his own friends from high school, and other great people whom he never would have met if not for the band. Ian has Bachelor of Music degrees in both Trumpet Performance and Jazz Studies from The University of Akron. 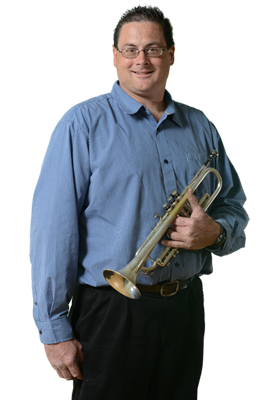 He has a Master's of Music degree in Trumpet Performance and a Master's degree in Music Theory, both from Kent State University. He has toured nationally and internationally with the Tommy Dorsey Orchestra, performed for two U.S. Presidential Inaugural Balls in Washington D.C. and has performed with the Akron Symphony, Canton Symphony, and the Erie Philharmonic. 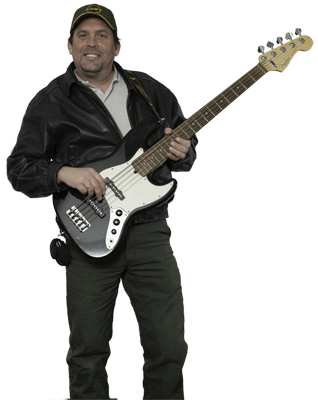 Over the years, Ian has performed with more than 100 musical groups in the area and frequently travels to Detroit, Chicago, St. Louis, and New York City to perform. Currently, he directs the Jazz Band at Mt. Union College. In the past, Ian has also maintained a private studio of more than 60 students, assisted public school music programs for more than 14 years, directed music for a church for four years, and organized many other musical groups. In addition Ian has also become active as a sound engineer with various musical groups including society bands, Latino groups, Jewish orchestras, and opera productions. He learned his sound-tech trade from Bruce Walker, an outstanding musician and instrument repair specialist who owned Walker Music, where Ian worked before acquiring the business. Now named Indorf Instrument Repair, the company is located in Tallmadge OH and specializes in repairing and customizing brass, woodwinds, and string instruments. Scott plays acoustic and electric drums. He began drum lessons in elementary school and continued through high school. He played quads in the marching band at Willoughby South and was in the rock band No Money when they rocked their way to 2nd place in a Battle of the Bands competition at USA Skates in 1986. Scott later sold his drums and gave up playing for ten years, "to be a grown up" and focus on his work and family. He met Art Stitt and Danny Powell at a party, and the three hit it off! He got the itch to play once again and purchased a new drum set. He began playing with the GPS Band and Bound 4 Rehab as well as doing studio and video work with Art and Danny. Gary was classically trained on piano beginning at the age of four, and played throughout childhood. After high school, he entered The Cleveland Institute of Art. His love of art -- an his artistic talents -- led to a 30-year career custom painting show cars and motorcycles. Twenty years ago, his interest in playing rock and roll peaked, and he joined classic rock band, Titanic. The band stayed busy, and Gary enjoyed the vibrant local rock scene, playing The Flats, Cleveland Cafe and several West Side clubs. Then came original band Lefta Center and his work with Theresa Zeleznick, Director of Music at Tri-C West: Gary wrote the music, and she wrote lyrics and sang. Later, he helped form Hooray for Tuesday, a band with his golf league buddies; and he's currently playing with Exit out of Painesville. 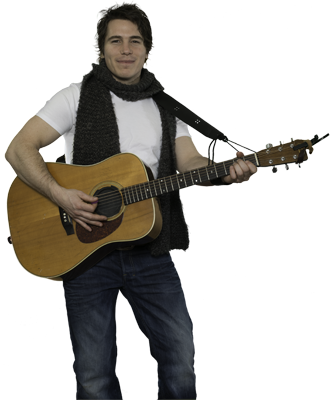 Jimmy Maguire is an accomplished guitarist, vocalist, song writer, and recording artist who can bring out the earthy depths of the soul on his acoustic or explode with high voltage energy on his electric. Jimmy grew up on the East Coast, playing music at untamed, amazing rock clubs including CBGB's, The Black Cat, the Limelight, Bitter End, the 9:30 Club, and others. He later went on to tour all across the United States and the United Kingdom where he was able to bring his stand-out versatility to performances with rock bands, pop bands, and Native American bands. 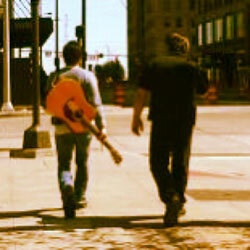 Several years ago, Jimmy and Chad Ely met at a chance encounter at the iconic Beachland Ballroom in Cleveland (OH) where Chad was working on a video shoot and Jimmy was the opening act. They became friends, stayed in touch, and re-united recently.